This short story was two years in the making. I dedicate in now to my mother, who chose four times. So pleased was the Lord with His creation, which he called Man, that He bestowed upon him gifts of the most wondrous kinds. He gave this special creature one other Gift He himself had only known, and valued as well – dominion, authority under every other living creature on the Earth. When Woman was created, the Lord wanted to give her a Gift as well. The Lord remembered the joy of fashioning life with His hands, the thrill of bringing life to existence, and gave this same gift to the Woman. The Woman received this gift with great joy. She and Man lived happily, as two parts of a whole, made exactly for each other. But the Enemy, who hated all good and despised all beauty, was bent on destroying their Paradise. And Woman, who once sang and danced with a sweet beauty that was enrapturing, now shuddered with dread and guilt – emotions once foreign to her. Man, who once praised her and sought to please her every moment, was now blaming her. Woman lay prostrate on the ground, with Man beside her. Out of the corner of her eye, she saw the Serpent slinking away, bearing the curses the Lord had just pronounced. The Lord’s punishments were severe. He took Woman’s gift away, as well as Man’s. Man, shaking with utter fear and shame, kept silent, prostrate on the ground where he had dropped in an effort to hide from the Lord’s searing gaze. Beside him, Woman was trembling, miserable as well. Unlike Man, however, Woman did not keep silent – she could not help it. Heavy sobs rose to her chest and broke the silence after the Lord’s Voice pronounced His judgment. She knew He was angry, and she was frightened. She had never known anger before. That she was an object of anger of such magnitude – it was too much! The novelty of it all added to her fear. Dare she speak to Him? But she did. With a silent, halting, quivering voice, she did. It was insolence, for sure, yet she could not help it. For although Woman had not known exactly what her Gift was, she had sensed that it was to be extremely valuable. She sensed it in the very fibres of her being. Woman lay with her chest heaving, awaiting the judgement. If more anguish could be borne, surely it was added to what Woman can bear. How could she have disappointed her Life Giver, her Creator, her God? And so it was that every Woman who chose to be a mother always made great sacrifices. For nine months, her body is not her own. When she finally gives birth, she faces extreme torment and pain, sometimes, even the prospect of death. Still, after months of pain and discomfort, with the child already in her arms, she knows her life will never be hers. She will continue giving of herself, knowing that this precious child will bring her joy and love and laughter, but also pain and grief. In choosing to give life to another, she chooses to give up her own. 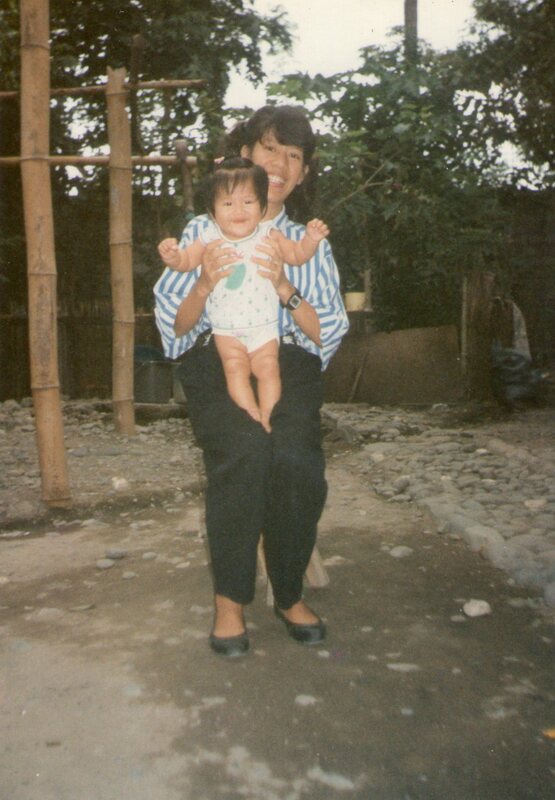 My mother and I way back in ’92. The first time she chose.